The Sweet Track (of which this is a replica) is an example of Neolithic engineering of a timber trackway, 6000 years old. An elevated footpath that ran for almost 2 km across the Somerset levels. 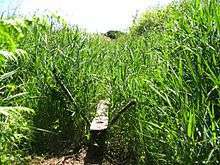 A timber trackway is a simple raised wooden walkway used as the shortest route between two places in a bog or peatland. They have been built for thousands of years as a means of getting between two points. Timber trackways have been identified in archaeological finds in Neolithic England, dating to 500 years before Stonehenge. Radiocarbon methods date them to be about 6,000 years old. The earlier corduroy trackways are in Germany and Holland. They date to approximately 3000 BC. Their construction is consistently between 3.5 m and 4 m wide, and are simple structures without pegs. The Lindholme Trackway is later and dates to around 2900-2500 BC. The construction for these is mostly 3 m, and occasionally up to 4 m, wide. Two possible pegs. Later corduroy trackways include the one in Cloonbony, Ireland. This dates to around 2630–2470 BC. The construction of this is 2.5 m wide (with the rails at 1.2 m apart). This is a more complex structure, pegged at intervals. The Lindholme Trackway fits within a trend of narrowing and increased sophistication during the third millennium BC. It has been argued that this shift could relate to the growing complexity of wheeled transport at the time. Sweet Track - one of the oldest engineered roads discovered and the oldest timber trackway discovered in Northern Europe. ↑ Chapman, Henry. "A Neolithic Trackway on Hatfield Moors – a significant discovery" (PDF). Thorne and Hatfield Moors Conservation Forum. Retrieved 20 August 2014. ↑ Whitehouse, Nicki (ed). "Thorne and Hatfield Moors Conservation Forum Publications - Papers Volume 7". Thorne and Hatfield Moors Conservation Forum. Thorne and Hatfield Moors Conservation Forum. Retrieved 20 August 2014. Medieval trackway and Roman smelting?